Trash hoppers for forklifts are a type of forklift attachment. They are basically big hoppers that are packed with an assortment of trash and debris. Pockets and safety chains allow them to lock to the forks of a fork truck in order for the operator to lift, transport, and then dump the hopper’s contents into a dumpster or similar container for collecting refuse. There are many different types of forklift hoppers. Our forklift trash hoppers offers variety of different load capacities, dumping mechanisms, and weight capabilities. All our trash hoppers are constructed from heavy gauge steel, the strength of which varies from model to model. A number of our heavy duty trash hoppers can move up to 3 tons of debris, roof tear off & garbage in one load. A forklift dumpster is easy and safe to use. The dump hopper is first placed flat on the soil so that a licensed forklift worker can drive the forks into the pockets and secure them to the hopper. Employees then load the forklift hopper attachment to maximum capacity with debris, and the operative picks the hopper above eye level in order to have adequate visibility to drive the forklift to the disposal area to dump its contents into a garbage dumpster. 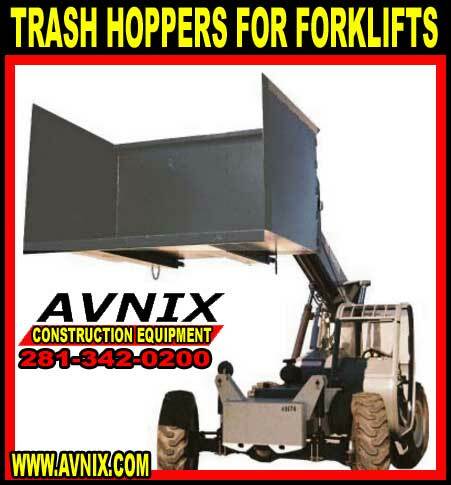 Avnix sells forklift hoppers to all kinds of commercial Businesses. In the warehousing business, trash hoppers play a very important part in keeping the areas around freight yards free of debris. An additional big user of forklift hoppers is the recycling industry. By means of more and more recycling collection centers being constructed across the country, forklift hopper attachments play an significant part in transporting recycling materials like plastic bottles, glass, cardboard, and metal from the collection areas to big trucks that carry them off to recycling plants. Dockyards as well use forklift hoppers to separate debris from material that are brought in on ships. An assortment of applications for these units are also found in factories, refineries, chemical plants, and distribution centers. The most frequent use of dump hoppers is in all probability found in the construction industry. Construction sites have a lot debris that the equipment yards must be cleaned up quite a few times a day. The best way to complete this is with a lifting device that will raise the debris safely and efficiently transport it to dumpsters so crews and vehicles can move about more freely and safely. Drop from masonry saw brick & block cutting. Roofing Tear Off & Replacment Jobs. Use As A Lift Platform For Material, Tools & Equipment. Positions Hoppers Where Needed – On The Floor, Elevated Deck, Or Roof Top. Workers to load Hopper Up As Work Progresses. Front completely open for unrestricted access. Material can be . . .
• Wheeled in with wheelbarrows. • Dumped from power buggies. • Loaded by compact loaders. • Thrown in by hand. • Durable 3/16″ plate steel for shell and sides. • Full length fork channels add strength to bottom and assure the correct forklift pick-up points. associated with chutes and slides. being dumped directly from elevated decks. AV-1420 5′ w x 3′ h x 5′ d 2.7 yd3 5,000 lbs. 790 lbs. AV-1425 5′ w x 4′ h x 5′ d 3.7 yd3 5,000 lbs. 880 lbs. AV-1430 7′ w x 4′ h x 5′ d 5.0 yd3 5,000 lbs. 1025 lbs.